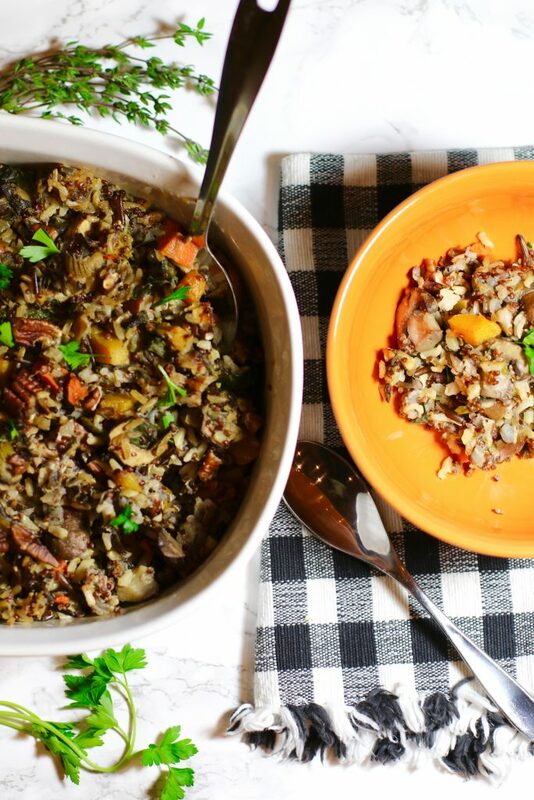 Yes, another stuffing recipe, but with a twist. 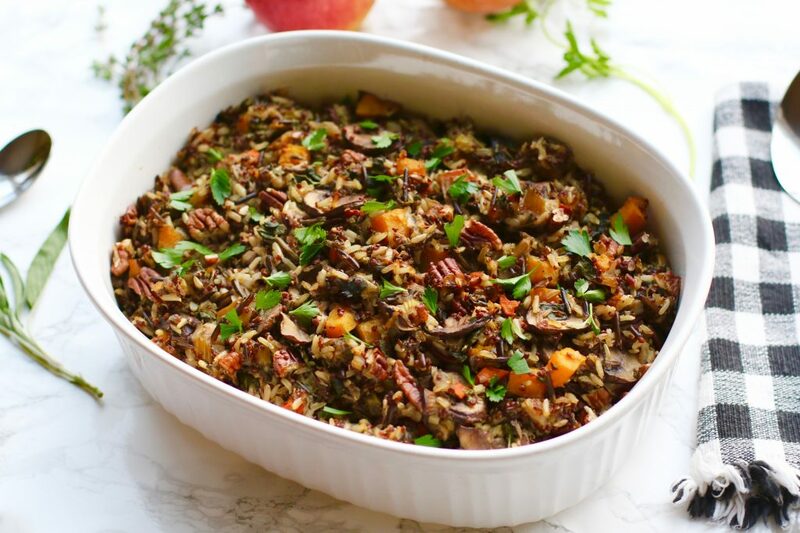 In keeping with the hearty, rich flavour you crave for in most meals this time of year, I managed to make a stuffing that tastes fantastic and is good for you as well. The recipe includes nothing but healthy goodness in each ingredient. 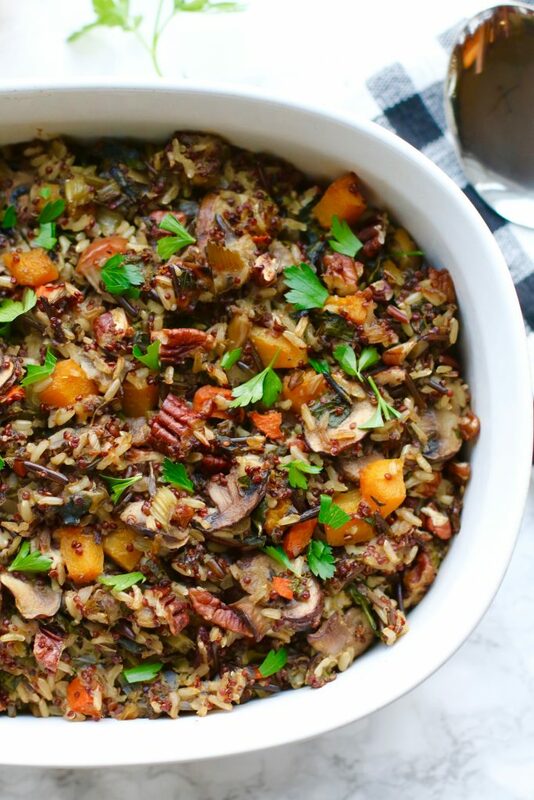 You can’t go wrong giving this GLUTEN-FREE, VEGAN dish a try for Thanksgiving. It’s been a crazy week and experimental cooking was high on the list of priorities. 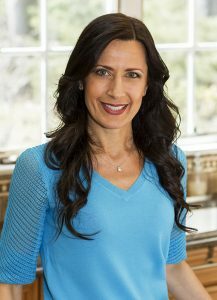 I have been busy training, blogging and running this household for the past few months that I was yearning to get back into creating new and healthy dishes. Although I am currently on a temporary hiatus from running since my unremitting heel pain refuses to stand down. Oh, and when I say “hiatus from running”, I mean a 3 miler every other day just to stay fit. I like to call it my therapy session and it helps keep some sanity in my otherwise insane life I have fortuitously created. However, I do thrive in the chaos. So, I am determined to win this heel battle once and for all with the help of Dr. Richard Braver. Finally, I will be able to start training for the Boston Marathon and enjoying the beautiful weather this time of year. 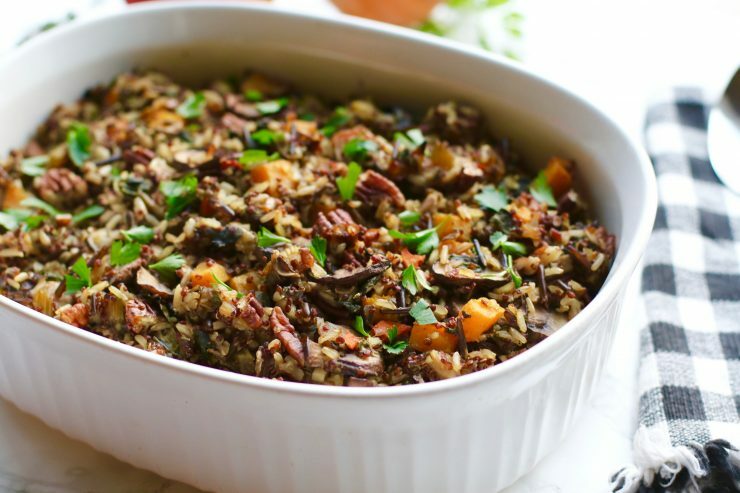 As I mentioned in my previous post, stuffing is one of those dishes that is quite interchangeable. After experimenting with my first recipe Easy Gluten-Free, Vegan Stuffing with Cranberries, I decided to make some modifications and eliminating bread all together was one of them. 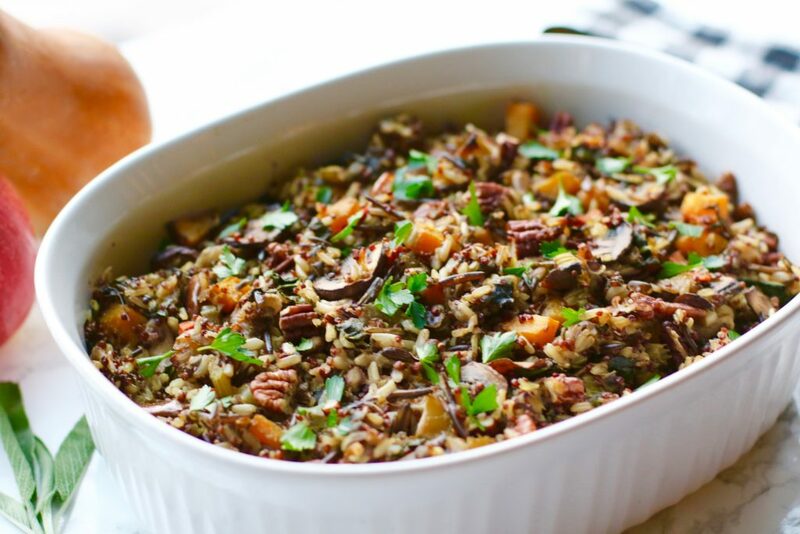 Replacing rosemary with thyme, cranberries with butternut squash, pine nuts with pecans, bread with rice/quinoa, I have come up with a much healthier version of stuffing and the flavour combination is divine. Take it from me, I just made enough stuffing to feed an army playing around with all these lovely ingredients. 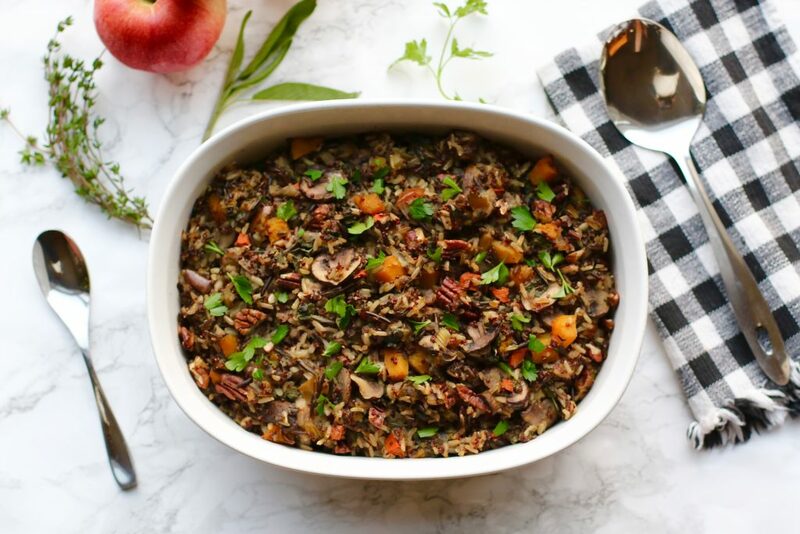 The perfect blend of GLUTEN-FREE, VEGAN ingredients makes this dish not only hearty, rich and flavourful, it is also a much healthier option. Perfect for a Thanksgiving feast that is sure to have your guests begging for more. Add broth and rice to a large pot and simmer covered for about 30 minutes or until almost all the water is gone. Mix in the quinoa and cover for about 15 more minutes so all the water is absorbed. Set aside. To make the flax meal egg, combine flax meal and water together in a large bowl until it becomes a yolk-like consistency. Set aside. In a large skillet sauté onions, garlic, celery, carrots in coconut oil over medium heat until fragrant. Add mushrooms and cook until they are tender about 10 minutes. Mix in the coconut amino, apples and butternut squash and continue sautéing until it is soft about 15 more minutes. Toss in the kale, sage, thyme, parsley and generously add salt and pepper. Cook for about 5 - 10 minutes and remove from heat. 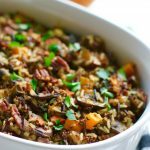 Combine the rice, vegetable mixture, flax egg and pecans to a 2 1/2 quart casserole dish and place it in the oven for 25 minutes covered. Remove the lib and cook for an additional 10 minutes so the top is crispy. Once cooked, remove the casserole from oven and serve immediately. I can’t wait to try this tomorrow. Happy Thanksgiving!